"Shikhar Dhawan, Rohit Sharma could get a break as well,” Ravi Shastri quoted. The all-important 2019 edition of the ICC World Cup is set to be played this year. The teams have started gearing up for the ICC major and the permutations and combinations about the squad for the tournament has already been bothering the team management. Among all the aspects that needs to be addressed here, a key note that the managements of all teams would be taking note of is to ensure that their players are well rested. Talk about fatigue, and the Indian team players come to the fore. It is not a new story to see the Indian team players feature in cricketing action throughout the year. With the IPL lined up for the players ahead of WC 2019, it is not surprising to know that the Indian think tank would want to rest their key players ahead of the World Cup. 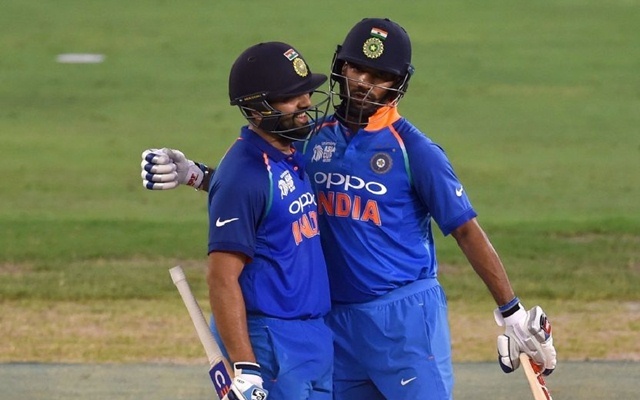 Recently, after team India won the ODI series in New Zealand, the Indian team head coach Ravi Shastri dropped a hint at potentially resting Shikhar Dhawan and Rohit Sharma from India’s next assignment. Team India is set to host Australia in a home series prior to the IPL. He also noted that Mohammed Shami, who was a star performer in the New Zealand series, deserves rest now. “There would still be one or two places we would be looking at. In general, the team picks itself. What you want is the team not losing form with five games to go for the World Cup. You, in fact, should grab every opportunity you get and make the most of it. Now, Shami would need a break – he has had a long season. Shikhar Dhawan, Rohit Sharma could get a break as well,” Ravi Shastri told Star Sports after the completion of ODI series. While it will not be tough for the selectors to replace someone like Shami in the side, since Jasprit Burma would make a comeback, resting Shikhar and Rohit could pose a lot of questions. Team India does not boast of backup openers in ODI cricket. If Dhawan and Rohit are rested, KL Rahul and Ajinkya Rahane could be tested as reserve openers. However, both these gentlemen are currently out of the ODI setup.